Jeesh! It's been so much longer than I realized since I've been on here! So today was the big day that Google Reader closed down...but I wasn't upset..in fact, over the last month or so I've fallen in love with Bloglines.com. The interface is much nicer and cleaner and in my humble opinion all around better! Have you had to switch to a new reader? If so which one? So...work has been keeping me busy...my boy just turned 12...my stepdaughter came to visit from North Carolina...I've been working on my projects for the Znet June challenge....I scrambled to get to a doctor who would give my son a camp physical as his previous year's physical was to expire two days before he was to go to camp...I had a custom order that I had a heck of a time finding the right, quality supplies for....and more!! So in lieu of more writing...here are some pics of what's been going on in my world! The blocks in the fountain are actually a map of Salem! I had to take a picture of this because it was the third of three bracelets...and there were EXACTLY enough seed beads for me to complete the final one!!! WOW! Sent this boy off to a week-long overnight camp! WHAAAAAAAT???? How did he get old enough to do that!? Oh! 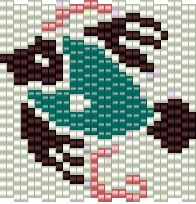 And I have been working on some patterns for the 2014 Bead-It-Forward quilt! Sounds like you've been really busy! I'm sure Jackson will have a wonderful time at camp. Our son loved going to Scout camp in the summers. Have a great 4th of July and I'll talk to you soon. I have GOT to get up north! I'm always reluctant b/c going around Boston will add miles and time, but going thru Boston is always a traffic nightmare. Right now the humidity is just too crushing to go anywhere. Happy 4th!! I haven't ever used a reader, just the list of blogs I am following from blogspot. Unfortunately, that doesn't work for anything but blogger blogs, so the wordpress and typepad blogs get lost in the shuffle. Even the blog list has been iffy lately, so I just added a bunch of links to my sidebar. Looks like a fun summer. It has been about 45 years since I was in Salem! Goodness, how time flies! Thank you for the Bloglines suggestion. I migrated my Reader feeds over and am really enjoying it. Looks like your summer has started out most fabulously Amy! It's crazy how fast the days seem to fly by once summer arrives.... and then we look at our blog and holy jeepers... where did those last few weeks go? Anyhoo, keep having fun, and making the most of every day!